Silver Acre was one of the first cottages built on Lake Salem and most say that it has the best location. Situated on an acre of land with a 200 foot lake frontage, Silver Acre has its own sand bar and the Clyde River running beside it. The cottage has 2 bedrooms, a loft with two single beds that is always popular with children, and screened front and back porches. Side Yard. Great fishing spot! The cottage has two queen beds and four single beds and is ideal for a family with small children. It has a well-equipped kitchen which looks out on the lake. 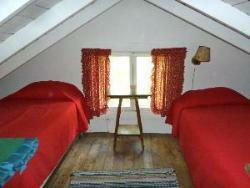 The cottage has a Franklin stove and a cozy living room for dining or doing a puzzle. The bathroom has a hot water shower. Fun sleeping loft with 2 twin beds. hopefully with the catch of the day!